Bad Weather? Who Cares When You Have A High Efficiency Heat Pump! Portland can have interesting weather patterns, but who cares when you have a Rheem Heat Pump! A heat pump is a perfect choice for because they offer high energy efficiency ratings and they are practical, convenient and environmentally friendly as well. The most important factor in buying a new heat pump is hiring the right heating and cooling contractor. A qualified and trained HVAC contractor will know how to evaluate your home and make sure to guide you toward the right heat pump for your needs. Why Rheem? Founded in 1925, their mission is simple. Help your family enjoy a new degree of comfort with solutions that keep you cool in the summer and warm in the winter. 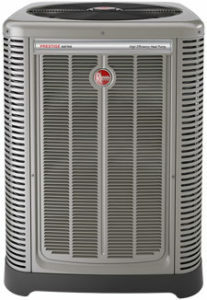 Rheem offers a broad line up of heat pump products that fit every budget and every home. Is a heat pump right for your home? We’ll help with that. Chances are you didn’t choose the heating and cooling system in your home. We’ll take the time to understand your unique set of needs. Heat Pumps offer 2-in-1 functionality – a heat pump allows you to switch from heating to cooling in an instant. Heat pumps can heat up or cool down a room within a few minutes, then, once the room reaches your preferred temperature, the heat pump will maintain that temperature for as long as you require it to. And unlike gas heating or wood burners there are no flames or hot surfaces to worry about. Heat Pumps control the climate– Most of us have our own definition of what comfort is. A heat pump provides you with the ability to easily control and maintain your indoor climate to your own specific needs. Heat Pumps are extremely energy efficient and eco- friendly. – They offer one of the most cost effective forms of heating and cooling. A heat pump does not burn anything as the heat energy source so there are no carbon emissions other than the tiny amount of electricity that it uses. Heat Pumps can add value to your home – As Heat Pumps become more popular, they are adding value to your home. A warm, dry, comfortable environment with the addition of air conditioning will always be a plus to a potential home buyer. A high efficiency heat pump is a natural choice for Portland Oregon. A heat pump is a safe, clean and cost-effective way to heat and cool your home. To find out more about how you can benefit from a heat pump Get A Quote or call today: 503-233-3133.